This chapter focuses on Andrew Holleran’s portrayal of New York’s gay cruising culture of the 1970s in Dancer from the Dance (1978). Hess first explores the novel’s focus on youth and the protagonist’s inability to imagine a queer future. She then engages J. Jack Halberstam’s and José Muñoz’s writings on queer failure to foreground the subversive potential inherent in Dancer with regard to the characters’ failures to adhere to the linear life course. 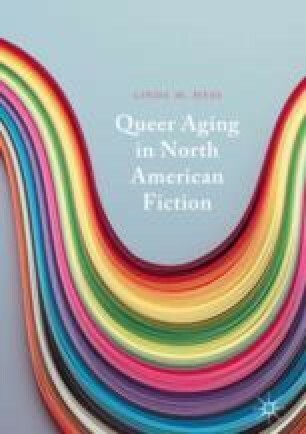 In the last part of the chapter, the author employs Dustin Goltz’s strategy of “looking towards the margins of the cultural screen” to analyze Dancer’s instrumentalization of its own margins as an intervention that invites the reader’s critical reflection on the main narrative’s stereotypical portrayals of gay aging.